A second map pack for Modern Warfare 2 has been confirmed by Activision. There was a time when buying a "map pack" meant that you wouldn't get lost on a trip across the country. Now it refers almost solely to the DLC that expands online first-person shooters, such as the Modern Warfare 2 Stimulus map pack. Get ready to be stimulated again, because Activision has confirmed that a second map pack is coming to the game this year. On a recent Activision recent financial earnings conference call, employees of Activision discussed earnings related to financial activities. 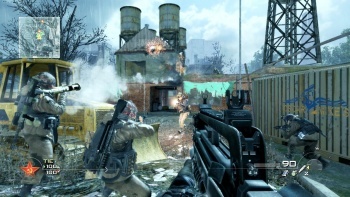 Activision COO Thomas Tippl also revealed the second Modern Warfare 2 map pack, presumably in-development by the remaining employees of Infinity Ward. Even with the shake-ups going on at IW, if this new map pack surprises you, welcome to your first day outside of the womb. The Stimulus pack clocked in at a slightly heftier $15 compared to previous map pack releases, and Activision is planning to keep the price right there. "The $15 price point has still provided a fantastic value to gamers.. we think that has worked," Tippl said on the call. While the fantastic level of the value here is in question, it doesn't matter, as more than one million people whipped out their $15 for the Stimulus pack on Xbox Live alone in one day. You screwed yourselves gamers! No other details were provided on the second map pack, but they'll trickle out eventually.